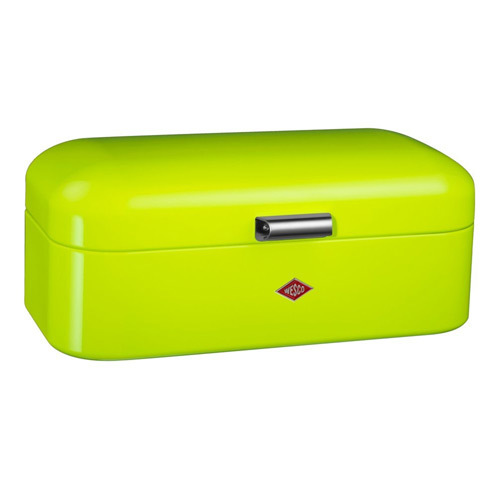 The Wesco Grandy lime green bread bin will certainly stand out on any kitchen work space. The large and spacious bread bin from Wesco is available in a range of bold and bright colours. Wesco bread bins are guaranteed be a talking point and highlight in any kitchen area. If you love your lime green kitchen accessories in a 1940’s / 50’s retro style then the Grandy lime green bread bin from Wesco is sure to impress. The stunning bright green colour combined with the sleek and smooth design, make this retro looking bread bin a very contemporary and stylish choice. The lime green bread bin features an airtight seal to ensure everything within it is kept fresh. The bread bin additionally features ventilation holes on the back, further helping to keep bread and cakes fresher for longer. Made from high quality powder coated sheet steel, this large bread bin has the following dimensions: Length: 42 cm, Height: 17 cm, Depth: 23 cm. It can also be matched with a range of other lime green kitchen accessories from the Wesco range. If you love your kitchen accessories to stand out, Wesco are an amazingly colourful brand to consider. The curved design of their items combined with lovely chrome accents really make them a highlight in any kitchen. Wesco are a brand that we always highly recommend, as well as a brand highly recommended by others. A company that always create stunningly designed kitchen accessories that are always highly unique. Wesco are a brand that consistently create items that are very different in looks and style. When compared with many other high street brands you can easily see why Wesco products really stand out. Why not take a look at what other buyers have said about this wonderfully bright lime green bread bin in the next tab. Or you can visit the retailer to view more stunning lime green kitchen accessories from Wesco.